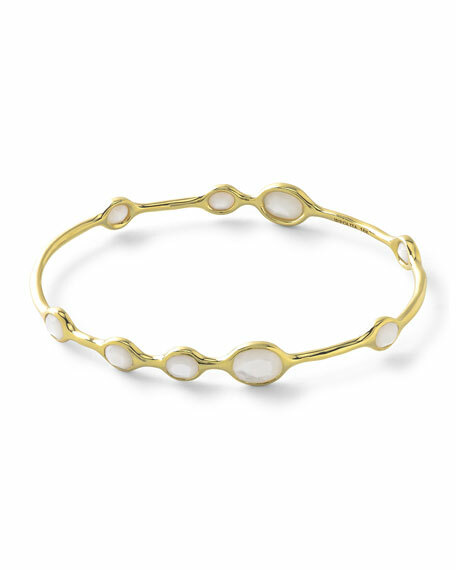 Ippolita bangle from the 18K Gold Rock Candy® Collection. 18-karat yellow gold with textured finish. 6.3 total mother-of-pearl carat weight. Oval-shaped for secure fit; 2.6" x 2.3" opening. Renowned for creating effortlessly chic jewelry, Ippolita Rostagno launched her successful 18-karat gold collection in 1999. Combining the rich Florentine aesthetic of her Italian heritage with a modern flair, the unique designs of her handcrafted jewelry have developed a fan base that includes celebrities around the globe. For in-store inquiries, use sku #2084510.